To squish or not to squish? The first picture on the left is of a caterpillar egg on a tomato leaf. I suspect it was placed there by a Hummingbird Moth (Hyles species), and will hatch out to be a hornworm. The second photo is of an Orange Dog caterpillar egg on a lemon leaf. It's the egg of the Giant Swallowtail butterfly. The Hummingbird Moth and the Swallowtail butterfly are both beautiful bugs; neither in their adult form causes any sort of garden damage, and both provide valuable and desirable pollination in the Desert Garden. The Orange Dog Caterpillar and the hornworm are both ravenous eaters of plant material and can rapidly defoliate a good area of a given plant. On a quiet evening in the garden, if you get close enough, you can actually hear the hornworm chewing and munching. As always, our goal is not to control the insect, but to control the amount of unacceptable damage caused by the insect. Chances are that each of these caterpillars will eat about the same amount of foliage, if allowed to hatch and feed. So, we can look at it this way: is the plant going to sustain enough damage from this bug to impair its productivity or appearance? Given the size of the lemon tree relative to the size of the tomato plant, the hornworm egg got squished, and the Orange Dog was left to hatch. That won't be the end of it, of course: for every caterpillar egg that we see, there are untold numbers that we don't. Just as well; it keeps life in the garden interesting. Never add wood ashes to your compost pile in the Desert Garden. Never, never, never, never, never, never, never. Wood ash is extremely alkaline, and has high levels of calcium carbonate. While our desert-adapted plants do fine in our native alkaline soil, increasing the alkalinity with wood ash will damage their ability to take up and utilize soil nutrients. Our non-desert-adapted plants — those on which we are likely to use compost — are already struggling in our alkaline soils, and compost with wood ash in it is worse than adding no compost at all. Most vegetables, for instance, do best in soils with a pH ranging from around 6.0 to 7.0, while our native soil tends to be around 8.0 and above; adding wood ash raises the pH to a yet higher level. One of the challenges we have in gardening and landscaping in the desert is that much of the gardening tradition and research in this country derives from and is centered on Northern and Eastern climates with higher rainfall. Often, when we pick up a gardening book, or read gardening advice on-line, we can easily discern the parts that don't apply to us here in the Desert Garden: dealing with deep snow, or excess rainfall, for instance. We don't as easily pick out the more subtle differences. Of those subtle differences, one of the most important is our soils. Almost nothing that you read about soils in a gardening source is relevant to the Desert Garden, unless that source is specifically targeted at the desert. And even then you need to read with a skeptical eye. A few days ago, one of our major desert newspapers ran a column by their garden writer declaring that wood ashes are appropriate to add to a compost pile. The columnist cited a government publication from the Northeast as the information source. Shredded newspaper, by the way, is an excellent addition to the compost pile. My pomegranate, which has happily grown in my back yard for about five years now, has beautiful flowers every year but never any fruit. A friend said it was because I wasn't watering it. But after reading your post, I'm wondering if mine might simply be a non-fruiting variety. The flowers look more like pink carnations than the blooms you show. From the picture you sent, it's clear you are the possessor of a truly beautiful pomegranate. A beautiful, and, in the most literal sense, fruitless, pomegranate. No amount of water will make it set fruit. I admit to a great bias in favor of edible plants. Fruitless flowering plum trees and flowering pear trees seem rather silly things to put in the landscape when we consider that fruitful varieties of the same plants provide the same floral display, and, for about the same investment of water, provide edible fruit at the end of the season. Those are fruitless in a more figurative sense: purposeless, pointless, and wasteful. Your flowering pomegranate falls into a slightly different category; in order to produce good fruit, a fruiting pomegranate requires not heavy but steady irrigation throughout the fruiting season; wide fluctuations in soil moisture levels result in dry and split fruit. A flowering pomegranate, on the other hand, does just fine with much less water, and will still provide you with beautiful bright green foliage and stunning flowers. If you want to add pomegranate fruit to your landscape, go to a reputable local nursery and ask for a fruiting pomegranate variety called "Wonderful." It provides the best and most reliable fruit. In this week's installment of our ongoing quince saga, you will have noted immediately that the blossom, at the aptly named blossom-end of the quince, has faded and turned brown over the course of the past week; not much else has changed. We use the term blossom end as a convenient way to describe the end of a fruit opposite the stem. For the quince, that's also accurate; the quince has what is called an inferior ovary, meaning the ovary is behind the blossom and the blossom, as you can see in the picture, stays on the end of the fruit as the fruit grows behind it. Other fruits have what's called a superior ovary, meaning the ovary is in front of the petals. If you have a citrus tree in your garden, look closely as the fruit is first forming and you'll see that the petals are at the stem end of the fruit until they fall off; citrus blossoms have a superior ovary. In any event, blossom end is the conventional term for describing the far end of a fruit. Blossom-End Rot is the name of one of the tomato fruit pathologies most common in the Desert Garden, even though the tomato, like the citrus, has a superior ovary. A few days ago I discovered that several of my tomatoes had blossom-end rot; knowing that it's not really the blossom end doesn't make it any less annoying. This is a photo of the rare Two-Headed Silver-Spotted Butterfly. It is a non-migratory species, because it can never agree which direction to fly. This is actually a photo of two Gulf Fritillary Butterflies, in the middle of mating. I spotted them a couple of days ago on a tomato plant. The Gulf Fritillary is fairly common in the Desert Garden, and one of the handsomest of butterflies. We most often see the pale spotted undersides of the wings, as pictured here, but the top sides are a rich bright orange (see below). The Gulf Fritillary is an example of very specific adaptation; its larvae (caterpillars) eat only the leaves of members of the Passion Flower genus (Passiflora). If you grow a Passion Flower vine in your garden, you can be certain that the Gulf Fritillary will find it and the caterpillars will eat it nearly to the ground. Not being a great fan of Passionfruit, I don't consider that such a bad thing. If you're keen to have Passionfruit from your garden, try this: plant several Passion Flower vines, and treat one or two of them with BT (Bacillus thuringiensis) when you first spot the butterflies fluttering around, and subsequently, as needed, carefully following the label directions. Leave a few of the vines untreated and let the caterpillars have at it. As the adult butterfly visits many different flowers, it's worth viewing this insect as beneficial. As a side note, this butterfly's larval food, the Passion Flower, derives its common and botanical names not from any aphrodisiacal powers, as is sometimes assumed, but from the Passion of Christ. The various parts of the vine and its flower's elaborate structure are taken to symbolize the Crown of Thorns, the three nails and five wounds, the lashing, the Centurion's spear, et cetera. All bugs are, in their own peculiar ways, interesting, but some bugs are simply amazing. This Dragonfly falls into the latter category. I spotted it the other morning as it was resting on the Minneola Tangelo tree. The picture doesn't do it justice; it was a good four inches from stem to stern, and the green portion of its body was slightly iridescent. This was a big sparkly dragonfly (click the picture for a larger view). Dragonflies are voracious eaters of mosquitoes and flies, and thus count as top-ranked beneficial insects, even if you're not a gardener. Considering the size of this one, I can only imagine how many mosquitoes it must eat to keep going. Notice in the picture the spattering of what looks like white-wash on the leaves below and to the right of the dragonfly's wings. That's the result of a different insect, called a sharpshooter, a piercing and sucking insect that is very fond of citrus; the white substance is dried sharpshooter exudate. If you've ever stood under or near a citrus tree and felt a tiny sprinke, as of raindrops, that's what you were feeling: Sharpshooter exudate. A gentle rain of insect poop. It won't hurt you. Baileya multiradiata, also called the Desert Marigold, is a tough and colorful perennial addition to the Desert Garden. While it's easy to disparage the seemingly endless display of "little yellow flowers" in the desert landscape, it's hard to dismiss a flower that so reliably and easily provides a nearly year-round floral display. It will take full or reflected sun and extremely low water; I've seen this plant growing in the cracked pavement at the edge of a highway, merrily blooming away. A good soak mid-way through a dry spell will keep the bloom going, and shearing back the dead flower stems once or twice a year is the extent of its maintenance needs. It grows to about a foot tall and two feet across, with bright yellow 1- to 2-inch flowers held well above it silvery, woolly foliage. Desert Marigold is often available in plant form at nurseries but is just as easily grown from seed, reaching flowering size in a single season. When planting it from pots, you'll need to strike the right balance between enough water to keep it alive and not so much that it rots out; it requires good drainage. It will re-seed vigorously anywhere the seeds can find a crevice to land in and a little moisture to jump-start them; the woolly-gray seedlings are distinctive. B. multiradiata is native throughout the low elevations of the West and Mexico. Its common name derives from its perceived similarity to the common Marigold, to which it is not closely related. It's genus name is after Jacob Whitman Bailey a Nineteenth Century American naturalist, while its species, multiradiata, is Latin for "many rays," referring to the many flower petals of the bloom. Use Desert Marigold for bright spots of color in a casual xeriscape, as part of a wildflower mix, and as a fast bloom in a newly planted desert landscape. In a more structured landscape, try B. multiradiata as a foreground plant for darker green and smooth prickly pears such as Opuntia ficus-indica, or large green agaves such as Agave weberi. It's raining here in Phoenix today. Two days ago it was 108 °F, dead dry and windy. Today it's 75 °F, overcast and raining. And not the kind of torrential downpour that accompanies howling thunderstorms during the monsoon season, but a nice steady, look-there's-a-mud-puddle-let's-go-for-a-walk-and-then-bake-cookies kind of rain. In the Desert Garden, rain is always a welcome event, but even more so in May, which is typically the driest month of the year, averaging around one-tenth of an inch of rain at best. In the Chihuahuan Desert, to the South, the greatest amount of rain falls in the late Summer months; in the Mojave Desert, to the North, the period of greatest rainfall is in the Winter, from October through March. Here in the Sonoran Desert — smack in the middle of the other two — we have the best of both, but are still left with a difficult dry period as the weather really heats up in May and June. Rain, as distinct from irrigation water, has a magical effect on plant growth. As carefully as we may water with irrigation water, plants respond to rain with noticeably greater effect. There are a few reasons why plants respond to rain water. While pure water is at 7.0, or neutral, on the pH scale, rain water dissolves atmospheric CO2 as it falls, creating a very weak solution of carbonic acid. This slightly acidic water helps to free up soil minerals that are generally locked away in our alkaline soils. Interestingly, rain accompanied by a dust storm during the monsoon can carry enough dissolved alkaline dust particles to move its pH back above neutral, to the alkaline side of the scale. Next, rain water is free of the dissolved salts that are present in our irrigation water, and so dilutes soil salinity, which is almost always good for plants. And, last, rainwater tend to contain dissolved atmospheric nitrogen, so it's as if the entire landscape gets a light dose of fertilizer. Plus, the plants all get a good shower to wash the dust off, which is bound to make them feel better. Unlike one of your recent correspondents who wished to kill his oleander hedges, my partner and I, who are new to Arizona, would very much like to nurture ours. Unfortunately, we've received conflicting advice about how much to water them. One neighbor recommends a brief daily drip; another suggests a single monthly soak. What is the best method for watering oleanders in the desert? For all the disparaging remarks to which oleanders (Nerium oleander) are subject (and I freely admit to maligning them on a regular basis), there is no doubt that they have certain qualities that recommend their place in the Desert Garden. They're green, tough, heat-and sun-tolerant, fast growers, they spend much of the year covered in big bright flowers, and they make very good screening plants. Out of respect for your desire to nurture yours, I won't mention that they are large, poisonous, overbearing weeds capable of taking over the world. Neighbor number two called this one correctly: Oleanders do best with deep but infrequent watering, as do all plants in the Desert Garden. The idea is to develop a deep and strong root system to support the plant and to help it tolerate drought. Plant roots will only develop in the presence of moisture, so if the moisture is confined to the top layer of soil, as a result of shallow watering, then the roots will tend to stay in the top layer as well, making them more subject to damage from sudden or prolonged drought. Water no more than once a month, and water so that the soil is moist a good two feet down; during rainy times of the year, skip the watering altogether. Most oleanders that I've encountered receive far more water than they need to remain healthy and attractive; I think we tend to believe that any plant with large colorful flowers needs lots of water. Too much water on an oleander leads to vigorous and soft growth, which then calls for severe pruning to maintain the plant's size and shape. Heavy pruning on an oleander also leads to vigorous and soft growth, and in short order you're in a never-ending cycle of pruning, watering, and pruning again. Also pay attention to what water your oleanders may be getting from other parts of your or your neighbors' landscape. An oleander planted alongside turf (even on the other side of a neighbor's wall) may be getting all the water it needs from the grass nearby. Watering deeply and infrequently is the best way to nurture your oleander and be certain that it develops the deep, strong, and healthy roots that future residents of your house will someday curse to Heaven. The Leaf-footed Bug comes by its name easily; the flattened area on its tibia looks like a bit of leaf (left, in the photo). This particular specimen was spotted on a corn leaf; the whitish dust on the leaf is corn pollen. The picture shows the bug larger than life-size, but it is a large bug; this one was a bit more than an inch in length. One of the largest of the Desert Garden's piercing and sucking insects, it damages plants directly, and also indirectly through the bacteria introduced into the holes it makes. Notorious for damaging pecans and pomegranates, the Leaf-footed Bug is polyphagous, so if you, too, want to eat a lot of different fruits and vegetables, it's worth your while to eliminate this bug when you find it in the garden. Spraying insecticides to control them is unnecessary and a waste of money, so don't bother. Of the three S's of basic insect control (squishing, swatting, and snipping), this one is definitely too big and too agile for any but snipping, to which the pictured specimen responded in the desired manner. Consider using long-handled scissors, as these guys are closely related to the stink bugs. Earlier today I walked past a television that was showing a talk show in which, one by one, a series of women were displayed in a transparent case on a public street and passersby were asked to make comments about how each woman looked. After that, the women were sent off for plastic surgery and cosmetic dentistry and new hair and clothes, then brought back and paraded across a stage to raucous applause. The consensus was that the participants were much better people at the end of it all. It was fascinating and enlightening; I mention it only because it temporarily distracted me from writing this post, which is about home-grown fruits and vegetables. If you're new to growing your own fruits and vegetables, there are a few things that you'll find rather different from what you're accustomed to in shopping at the market. In nature, fruits and vegetables do not come in the uniform shapes, sizes, and colors that we see displayed in the tidy produce department cases. Producers and grocers provide uniform fruits and vegetables because that's what they believe consumers expect; consumers expect uniformity because that's what they have been consistently offered. Your vegetables do not have to be all the same shape or the same size. Variety is natural, and is one of the delights of the home garden. Don't worry about a few spots or blemishes on the peels or skins of your fruit and vegetables; as long as the inside is in good shape, then the fruit is fine. On the other hand, if the inside is rotted or otherwise damaged, it doesn't matter how good the outside looks. Much of what we see in the market are produce varieties that have been developed for appearance only; unfortunately, exclusive attention to outside appearances has led to much produce that has odd textures, is tasteless and insipid, and is lacking in nutritional value. When selecting fruits and vegetables to grow at home, look for varieties that provide interest, nutrition, and taste. Many of the fruits and vegetables in the grocery are picked while still immature and then kept fresh-looking for as long as possible by the misting systems in the produce department. Once the produce starts to fade a bit, it's discarded, even if it's still edible. Fruits and vegetables attain their highest flavor and nutritional value when they're allowed to fully ripen. You can expect your mature home produce to have more well-rounded and complex flavors than you're accustomed to tasting. Don't worry about your fruits and vegetables looking like the pictures you see in seed catalogues or gardening books; those are often idealized and unrealistic depictions, well beyond the ability of real gardeners. It takes a lot of work and time and chemicals and skilled photography to make fruits and vegetables look that good; best to just ooh and aah (or, better yet, laugh), and then get back to your garden. Attention to the basics is key to growing good fruits and vegetables. Give your plants a healthy environment, learn something about their needs and meet those needs to the best of your ability, have realistic expectations of what they will produce, and learn to appreciate the often unexpected qualities that each brings to your table. The artichokes (above) were part of dinner the other evening. My guests didn't seem to mind that some were odd sizes, all a bit misshapen, and that one of them had some odd purple spots; once we got down to the artichoke hearts, each was really quite sweet. Kind of like "Shark Week" but on a much smaller scale. The Desert Garden is at all times literally crawling with insects of all shapes and sizes, but this week in particular has revealed some fascinating specimens, many of which were kind enough to pose for the camera. I'll share a few of them over the next few days. Today's bug is one of the most beneficial of garden insects, a Ladybug nymph. I came across it as it was eating lunch on an artichoke leaf. If you look carefully at the photo (click for an enlargement), you will see the black and orange-spotted nymph using its forelegs to hold a brown oval thing. That brown oval thing is a rather fat and juicy aphid; the thread-like bits extending to the top and to the left are the aphid's antennae and legs, respectively. The Ladybug nymph is — and there's no way to put this delicately — slurping out the insides of the aphid. It's worth learning to recognize what a Ladybug nymph looks like; they are champion aphid-eaters and we don't want to destroy them inadvertently. In real life, they're only about a quarter of an inch long at most, fairly fearsome to behold — a bit like a miniature Gila Monster — but completely harmless to people, small children, and pets. Unless you have a pet aphid. The fruiting quince is an unusual but wonderful addition to the Desert Garden. It forms a handsome small shade tree with pretty pink Spring flowers, and pays off at the end of the season with large fragrant fruit. It has recently come to my attention that some people have never watched a quince develop and ripen. Starting this week, we will follow the development of one single quince fruit, from its beginnings as a newly pollinated little lump, through the vicissitudes of weather in the Desert Garden, to its eventual (keep your fingers crossed) full development, ripening, and harvest. Think of it as a public service. To get things started, here are the first three pictures, depicting, in descending order, the life of the quince from fruit set to what is best described as "a few weeks after fruit set." Notice in the last picture that it's actually beginning to get a bit chubby. Stay tuned for future episodes. Having spent the better part of Saturday removing plastic and landscape fabric from a client's yard, this seems a good time for a reminder of why they're a bad idea — if my aching muscles can manage the typing. This particular landscape has had a problem with intermittent flooding for years, and it was the search for the supposed leaky pipes that led to the discovery of the real problem: plastic and landscape fabric had prevented irrigation water from reaching the soil, resulting in runoff. It had been flooding for years, but there was enough gravel on top of the plastic and fabric that only occasionally did the water rise high enough to be visible and run into the street. Large sheets of plastic and landscape fabric are typically laid on top of soil in an effort to prevent weed growth. Unfortunately, they don't work, and they cause a host of other problems along the way. First, we'll take a look at why they don't work for weed control, and then we'll examine some of the other problems they cause. In theory, plastic and landscape fabric control weeds by preventing weeds seeds from contacting the soil and forming roots. What this doesn't take into account is the creation of a new soil layer on top of the plastic or fabric. While we tend to think of soil as something permanent, and the creation of soil as something that happened in the past, in fact new soil is being created every day. The specific process that concerns us here is called "wind deposition" and if you have ever seen a dust storm, you have seen it happening. All that dust in the air eventually settles out when the wind dies down, and when it lands on top of the plastic or fabric it creates new soil for weed growth; the landscape from Saturday had at least two inches of soil on top of the plastic and fabric. In some areas there was enough new soil that small plants had been planted without the fabric beneath them ever being discovered. If you're skeptical about new soil forming in such quantities, try this: don't vacuum or dust the interior of your house for an entire year, then measure how much soil you have on your living room floor. Send me an e-mail next year and let me know how that works out for you. To add injury to insult, plastic and landscape fabric create problems in addition to not solving any problems. First, they prevent water from reaching the soil. While new-generation landscape fabrics claim greater water and gas (air) permeability, remember that water always follows the path of least resistance, and if there is even the slightest slope, the rain or irrigation water will flow over the surface of landscape fabric, rather than seeping through. In the Desert Garden we need all the water we can get, and anything that creates a barrier between water and our soil creates a terrible waste. The second problem created by plastic and landscape fabric is the same as the first, but turned upside down. There will always be some moisture in covered soil, if only from seeping in at the edges, or from the holes cut for plants. As this moisture rises in the soil column, it becomes trapped immediately underneath the plastic or fabric, creating a permanently moist soil zone. Permanently moist and covered soil tends to form a "dead zone" where none of the activity that normally takes place in soils can occur. Even our tough desert soils are normally a hot-bed of activity: rain falls, the winds removes old and then deposits new soil, organic material falls on the surface and decays, the worms crawl in and the worms crawl out. You can see this for yourself: walk out into your garden and carefully make a footprint in an area of unplanted soil; in a fairly short time, that footprint will be gone. When we uncovered the soil on Saturday, we found footprints and tire tracks imprinted in the moist compacted soil, as fresh and clear that day as on the day they were created, more than a decade ago. The third problem created by plastic and landscape fabric is a direct result of the other two: because water can't penetrate the soil, and because a moist zone forms at the surface, the roots of the trees and other plants proliferate in the only available area of moisture and grow in a shallow layer just beneath the landscape fabric; instead of anchoring the plants deeply in the soil, the roots spread out on top of it. On Saturday, we found wrist-sized roots laying on top of the soil at distances twenty feet from the trees to which they belonged; these particular trees are small and fairly sheltered, but larger trees in a more open space would likely have blown down by now. And last: in all but a very rocky or very sandy soil, the constant pressure of a smooth fabric or plastic layer on top of damp soil compacts and "burnishes" the soil surface to such a degree that the pores of the soil are all but eliminated, impairing the gas and moisture exchange capacity of the soil even after the offending material is removed. Such a "closed" soil only re-opens after a lot of time or a lot of effort. Weeds have been with us always, weeds will be with us always, and there is no silver bullet to kill them dead forever; anything that claims to be — whether physical, mechanical, or chemical — is a guaranteed misfire. There is a large oleander hedge on the property line between my house and my neighbors'. It's quite large, probably about 50 years old. Could you provide any suggestions on how to get rid of it? Thank you. By far the simplest method to eliminate a large oleander hedge is to move to a new home. Fortunately, there are a lot of houses on the market right now, many of them completely oleander-free. If for some reason you don't care to move, your next best option is to cut it down and have the remaining stumps ground out. You could in theory have the stumps pulled, but oleanders of a certain age have developed large and sturdy root systems, and that can be a real heartache. You may wish to hire a tree-removal service to do the removal for you, depending on the scale of the task. Whether you do the removal yourself, or hire someone, there are three important precautions to take. First, talk to your neighbor and make certain you are in agreement about taking it out; these plant contretemps can cause ill-will lasting for years. Next, call Bluestake, a free utility marking service that will locate and mark any underground utilities for you; you don't want to accidentally disturb gas or other utility lines. In the Phoenix area call 602.263.1100 or 800.STAKE.IT. Last, be certain whoever is cutting and grinding is wearing protective breathing masks and safety glasses; all parts of the oleander are toxic, including the sap and the dust generated by grinding. Even if the crew shows up without masks and glasses, get some and make them wear them; it will earn you points in heaven. Olneya tesota, the Desert Ironwood, is the signature tree of the Sonoran Desert, and the perfect tree around which to create a desert landscape. The Ironwood will grow at a slow to moderate rate to 25 feet wide and 25 feet tall, and eventually taller. Just now, in mid-May, mature Ironwoods produce a mass of tiny lavender-and-white sweet-pea-shaped flowers (above); they're not much at a distance, but up close the flowers are beautiful. The medium gray-green foliage is evergreen and fine-textured, casting a filtered shade; to my eye the overall look is reminiscent of an olive tree. The Ironwood can take full to reflected sun and very low water. The Ironwood has a reputation for slow growth that isn't justified. In the wilds of the desert it grows painfully slow, but with a small amount of supplemental irrigation in the domestic landscape, it's not markedly slower than any other desert tree. As with all desert trees, the key is deep but infrequent irrigation. Olneya tesota does have small thorns on the young branches, but these are subsumed in the bark on older branches and the trunk; you'd really have to work at it to hurt yourself with an Ironwood. The Ironwood is the largest tree in the Sonoran Desert and acts as a "nurse plant" to many other species, providing shade for young Saguaros and other cacti to get their start in life. It's common name comes from its extremely dense and heavy wood, which is used for carvings. The botanical name Olneya is in honor of a 19th Century American botanist named Stephen T. Olney; tesota is an indigenous name for the tree. Ironwood should only be pruned in the cooler months and then only lightly. It has a distinct habit of forming clusters of long upright branches when the crown in pruned or thinned with any but the lightest touch, and not just where the cuts have been made, but all over the tree. These upright branches wreck the form and shape of the tree. Left to its own devices it will grow into a graceful and spreading shape. It looks best when allowed to grow as a low-breaking or multi-trunked tree, and most pruning should be done gradually over a period of years to shape and direct the growth, or to raise the canopy. Use Olneya tesota as a signature tree, or as the foundation plant for a low-water but lush-looking desert landscape; it provides the perfect canopy of filtered shade for many species of desert-adapted plants, and it's fine-textured gray-green leaves make a perfect backdrop for some of the bolder and darker-green agave and cactus. An Ironwood may cost just slightly more than your average nursery plant, but with a life expectancy of up to 1500 years, on a pro-rated basis it's practically free. From the Inbox: Painting Palo Verde Pony Pruning? I have a quarter horse that cribbed on two Palo Verde trees located where I let her out. Once I noticed that she was doing this, I fenced off the area immediately, so that she would not be able to do it anymore. The trees have bloomed since this happened. Do I have to worry that this is going to kill the trees? If so what can I do to prevent this? A nursery told me to buy some pruning sealant and place it on them. M., in Cave Creek, Ariz.
Don’t use any kind of sealing tar or pruning paint on the tree wounds. Trees have a mechanism for healing damage, and studies have consistently found that wound sealant actually interferes with this mechanism and can result in worse damage. Palo Verdes are tough trees and will probably survive minor to moderate damage from your horse chewing on them. If the damage is severe enough to kill the trees, then there is nothing you can do to prevent it. Unfortunately, the tree blooming subsequent to the damage isn't a very good indication of whether the tree will live. Trees have two major layers of tissue just under the surface of the trunk; you can think of them as transporting water up the trunk and sugars and starches down the trunk. The outer layer, called the "phloem," moves the sugars and other substances created during photosynthesis down the trunk, to the roots and throughout the plant. The inner layer, called the "xylem," moves water and mineral nutrients up from the roots and throughout the tree. When the outer layer, the phloem, is damaged all around the trunk, water can still move up through the xylem and keep the tree going temporarily, but sugars can no longer move down to the roots; eventually the tree roots starve to death on a water-only diet. Because the sugars and other photosynthates are "trapped" above the damage, this can sometime result in really great bloom; kind of a last blowout celebration before the tree goes to meet its maker. Assuming that the trees aren't girdled (missing phloem all the way around their main trunks), then they should survive. If the horse took out enough of a chunk in one place, the tree may be structurally weakened, but, again, there's little you can do about it. Over time, the tree should form new tissue around and over that area, as long as you don’t put sealant on the wound. If these trees were in an area where they might topple and damage people or property, I would recommend that you carefully assess them, and possibly remove and replace them; because they're in a field, you probably have more wiggle room in giving them a shot at recovering. The corn patch was quite the social gathering place yesterday evening, and our attention was drawn in particular to two ladies we don't see very often. The first was the black form of the Ashy Gray Ladybug, glossy black with two almost-square crimson patches. An extremely decorative bug (right). The second, just two corn stalks to the Northwest, was the regular form of the Ashy Gray Ladybug, gray with a pattern of black spots (below). The name "Ashy Gray" makes a lot more sense with this one. I tend to think of ladybugs as red with black spots, and I suspect most people do, but ladybugs actually come in quite a variety of colors and spot patterns. No matter what color they are, they are all voracious consumers of aphids, white flies and other garden pests. Their larvae, which look like tiny Gila Monsters, eat even more. The corn has also been very popular this year with Green Lacewings, whose larvae rival the ladybugs' in lunching on pests. I noticed a slight development of aphids on the corn a few weeks ago, but their population declined very rapidly, so all of the beneficial insects must be doing their job. The aphids that didn't get eaten, I squished. You can use the Blue Orchard Bee nests, 3-5 inch deep holes fitted with paper (not plastic) straws, or just naked holes [drilled into untreated wood blocks]. The optimal hole diameter is 7 - 8 mm. Space the holes in a regular grid on 1/2 inch or 1 inch centers. Make sure the holes are blind-ended tunnels that don't come out the back of the block of wood. The time to place theses nests is NOW, during the Palo Verde and Ironwood bloom (some of their preferred plants). They also like mesquite. I have had about 12 of these nests on my back patio for the past 9 years. They routinely attract females of Megachile (the subgenus Chalicodoma, which used to be its own genus). These are large slender black and white-striped handsome bees with massive jaws. You will typically get 4 or 5 similar looking species. The end plug capping gives them away. Some species use masticated leaves, others use resin and sand and some form very messy looking debris end plugs with odd bits of bark, leaves etc. Enjoy! These pollinator pets make great watchable wildlife. Hang the wood block nests up high. At least shoulder height to about 8 feet up under an overhang so they don't get direct sun or rain. Face them south or SE. The nests will overwinter just fine. Sometimes you get a few native cuckoo bees, the parasitic genus Stelis. After a few years, you may want to put up freshly drilled nests near the old ones. Please visit www.pollinator.org for more information on native pollinators across the country. Stephen Buchmann is an Associate Professor with the University of Arizona Department of Entomology, founder of The Bee Works, and author of several books on bees and pollinators, including The Forgotten Pollinators, Letters from the Hive, and Pollinators of the Sonoran Desert; a Field Guide, all available through Amazon.com. 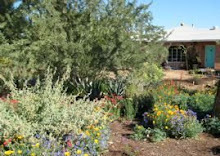 I will be presenting a seminar on the basics of using desert-adapted and native plants to create a shady, colorful, and low-water landscape, this coming Saturday, May 17, at the Fountain Hills Branch of the Maricopa County Library. 2pm at 12901 North La Montana Drive in Fountain Hills. Admission is free, and I think you don't even need a library card. Next to tomatoes, sweet corn may be the vegetable that home gardeners are most eager to grow. For me, sweet corn comes first on the list; while I have occasionally eaten a purchased tomato that had all the best qualities of home-grown, I've never had corn that came even close. This year at the Ranch, I'm growing a small plot of an heirloom sweet corn called Golden Bantam, grown from seeds purchased from Victory Seeds (victoryseeds.com) and sown directly into the garden. Golden Bantam is an open-pollinated "normal sugary" variety introduced at the beginning of the twentieth century, and it set the standard for sweet corn for most of the century. The hybrid "sugary-enhanced" and "supersweets" were developed for the market, with sugars that last longer; they're what you buy at the grocery. To my palate, they don't taste quite right. Irrelevant Side Note: I recently read in an organic gardening book that the "monotony of the common yellow cobs" may be relieved by planting white or white-and-yellow varieties. There are white and mixed varieties that are excellent and I encourage you to try them on their own merits, but anyone who finds "monotony" in home-grown corn of whatever color is deeply and possible irredeemably jaded. My block of Golden Bantam corn is about my height now, and the tassels are emerging from the top. I can see the ears beginning to form along the stalks, and very soon the silks will emerge, ready for the pollen to fall on them from the tassels and start the kernels forming. I put the corn in a little late this year, so we'll pray the weather stays cool enough that the pollen isn't sterilized. One pest you will almost inevitably have to confront if you grow sweet corn is the Corn Earworm, the larval form of a moth called Helicoverpa zea. The female moth lays solitary, though multiple, small white eggs on the corn silk. Once they hatch, the larvae head down into the ear, eating the silks and kernels and making an unappetizing and inedible mess out of your corn. Note the picture above, taken yesterday morning. It's a view from above of the tassels emerging. Note the small brown area at the base of the tassel, and now look at the enlargement of that area to the left. Yup, you guessed it: that's Mrs. Helicoverpa, here making an advance check on the facilities at her maternity ward of choice. You can squish her on sight, but she has friends to take her place. Four to six days after silk growth starts, at which time the silks should be mature, mix up a batch of BT (Bacillus thuringiensis) with ordinary corn oil. Using a narrow-aperture oil can, a syringe, or something similar, carefully apply 0.5 ml, or about 1/8th of a teaspoon, of the oil/BT mixture directly into the hollow at the center of the silks where they emerge from the husk, or slightly into the silk channel. The timing is important with this method: too early and it interferes with pollination; too late and control is poor. Using oil to smother the developing larvae was first used by farmers in the early 1940's using mineral oil; adding BT increases the effectiveness of the treatment, and corn oil is as effective as mineral oil while being exempt from pesticide labeling and tolerance requirements. It is the only control method available to the home gardener or farmer who doesn't wish to use synthetic insecticides, and it is highly effective. In field trials it has had a control rate nearing and reaching 100%. I planted grape vines this last spring. What type of care do they require? What type of fertilizer do I use and how often, etc., etc. Grapes are fairly simple to care for in the home garden, provided we have realistic expectations. Commercial grape growers and wine makers have very precise and sometimes complex routines that they follow, but for the rest of us, a few simple steps are enough to get some nice table grapes on a yearly basis, and an attractive landscape plant to go with them. And just so you know up front: you can throw your grape in the ground, fertilize when you remember, water when it looks like it needs it, prune only when it threatens to take over the world, and still have a big green vine. But if you want a little civility (and grapes to eat), keep reading. First year: One tablespoon of nitrogen in the form of ammonium sulfate in February, and another about now, early May. Second year: Two tablespoons of ammonium sulfate each month from February through June. Third year and beyond: The vine is maturing, so give each vine one cup of ammonium sulfate in February, one cup in March, and a third cup after bloom, early to mid-May. Also, give each vine one-half of a 5-pound bag of zinc sulfate with the February feeding, and the other half with the March feeding. These nitrogen levels are based on the generally poor level of nitrogen in desert soils. If after the first or second feeding of the season you find that your vines are healthy, green, and vigorous, halve or skip the rest of the season's nitrogen, to avoid over-fertilizing your grapes. Some people recommend a foliar spray for the zinc, but I find it easier to apply the zinc to the soil. When you fertilize your grape, first water, then scratch the fertilizer into the soil, and then water again. Watering first helps to prevent fertilizer burn. Moisture is important for vine and fruit development, so be certain that the soil never dries out completely from the time the leaves open until harvest; keep it moist, but never wet or soggy. Use several inches of organic mulch, such as small chipped bark or wood chip, to conserve water and to even out fluctuations in the soil moisture. Before you water, move aside some of the mulch; if the soil is still damp, then wait to water. Most of the soils I've encountered in Sun Lakes are a fairly heavy clay-loam, with good water-retention properties, which is good news for you. That means you shouldn't have too water too often, but you will want to water slowly and deeply each time you water. Use a soil probe to be sure that the water is getting down to a depth of two feet or more when you water; once you figure out how much water it takes to wet the soil to that depth, you then just always use the same amount. Whole books have been written on pruning grapes, but I'll get you started. For the first year, just let the vine grow; all those leaves are helping to build up a good root system for next year's big push. Whatever you're going to grow the vine on, have it in place before the second year's growth begins. This winter, when the vine is dormant, select one or two strong canes and prune off the other canes. Gently guide and tie your selected cane or canes onto your trellis, then cut them back to buds at about the height where you want the vines to branch. In their second year, the vines will branch from this point and form what are called laterals, which you can loosely tie to your trellis as they grow. Think of these laterals as your main structure or scaffolding; they will determine the overall shape of your vine. As a home grower, you can have as many laterals you wish at whatever height you wish, but too many will over-burden the vines and be a mess to prune. In the third year, branches will grow from these laterals, and in future years you will prune these branches back to two or more buds, depending on what variety of grape vine you have. Of selected varieties that do well in the Desert Garden, 'Thompson Seedless' and 'Black Monukka' are said to be best with what is called "cane pruning," while 'Muscat of Alexandria' and 'Perlette' are said to be better with what is called "spur pruning." A confession: two years out of the last six I pruned my 'Thompson Seedless' with the wrong method and couldn't see a scintilla of difference. Or even a whit. This should get you into year three with some happy and healthy vines. If you need more complete pruning instructions then, send me another note and we'll get into the nitty-gritty world of pruning grapes. I might even draw a little picture. The fruiting pomegranate (Punica granatum) is a tough and colorful multi-purpose plant for the Desert Garden. This large shrub or small tree grows at a moderate rate to eventually 15 to 20 feet tall and about half as wide. In late Spring it is covered in clusters of hot orange-red blossoms, each about 4 inches across, followed by equally decorative and edible fruit. The deciduous foliage is a bright dark green of medium texture, and the overall form of the plant is fountain-like, arching gracefully at the ends of the branches. The pomegranate does well with full sun, brutal reflected heat, or slight shade. Once established, it does well on moderately low water, and it will take salty soil, dry soil, wind, drought, and cold. There are non-fruiting varieties of pomegranates available, but the toughest, easiest, and most beautiful variety is called "Wonderful," a variety that also yields large edible fruit. As long as you're going to take the trouble to plant and water it, you may as well get some good fruit out of it. For good fruit production, the pomegranate doesn't require heavy irrigation, but it does need even moisture throughout the fruit-development period. Of Asian origin, Punica granatum spread around the Middle East and the Mediterranean Basin in ancient times, and seems to have developed cultural significance wherever it's grown. The fruit appears in ancient Egyptian, Greek and Roman art, and in paintings of the Madonna by both Leonardo and Botticelli. Granada, in Spain, is named for the pomegranate. It was introduced to North America by Spanish missionaries, and Navajo squash-blossom necklaces depict pomegranate flowers and fruit, not squash blossoms. The generic name of the pomegranate, Punica, is the Roman name for Carthage in Northern Africa, whence the fruit came to Italy. The species name, granatum, is Latin for "many-seeded," as apt an epithet as any. Use the pomegranate as a medium-textured deciduous shrub anywhere in the garden where it can have room to grow in its natural form, and where you can enjoy its bright flowers and fruit. It's a good plant for a transition zone between desert and and greenery, and can be used as an eventual small patio tree. The pomegranate makes a good wide hedge, but won't look or grow very well if it's pruned or sheared. Unexpected bonus: Look again at the photo above, in the top center. See that little white dot? Here's an enlarged view to the left. That tiny white dot at the end of a little filament is the egg of the Lacewing, a diaphanous green insect that you may see around the Desert Garden. Her larvae are voracious devourers of aphids and other pests, so when you see this little egg on its stalk, let it be. Building Blocks: Organic or Organic? "Organic" is a word we hear a lot these days, whether we're gardening or shopping for food or, in the latest trend, buying clothes. We see organic t-shirts and organic fertilizers, organic tomatoes, organic gardening, organic beef, organic certification, organic cosmetics, and probably a few organic things I haven't heard about. As is often the case with words, "organic" does not always mean the same thing, depending on the context in which it's used, and depending on how rigorously the definitions are being applied. Organic can refer to anything that was once living, or any part of something that was once living. In commercial food production, organic is a legal term, meaning that the food has been certified to meet certain standards. For the home or traditional gardener, organic generally refers to produce raised without the use of man-made fertilizers or pesticides, whether or not it meets any standard. In livestock, organic can mean meat or other products from animals raised without artificial hormones or antibiotics. Some people use the term organic to mean food produced from heritage seeds or animals, or from plants and animals that have not been genetically modified. At least one group has decided that to be organic, food production must "promote fair relationships and a good quality of life." I have seen a definition of organic food that says it must be produced in a "100% natural environment." Try that in the Desert. I haven't the foggiest idea what "organic cosmetics" means, though I'm sure they're lovely. Back to the real world: what do you do with all this? As a gardener, or as a food-eater, it's worth paying attention to the context in which the word "organic" is being used. If I suggest that you use an organic mulch on your vegetables, or add organic materials to your compost pile, I mean you should use some sort of plant material: straw, wood chips, grass clippings, coffee grounds, etc. Organic fertilizer usually means something such as cow manure, chicken manure, blood meal, bone meal, or rock phosphate, as opposed to processed granulated fertilizers. Organic pest control usually means using certain "natural" substances and methods. As a side note, do not ever confuse "organic" with "harmless." Vinegar (acetic acid) is a wonderful organic weed killer that can scar your skin and permanently blind you in a heartbeat. When you buy organically certified produce, milk, eggs, meat, pasta, or the like, that food has been certified to meet certain government standards. Government standards can and do change, and generally reflect political consensus rather than any specific and unchanging regimen. Some farmers or stockmen, especially smaller ones, sell food that you or I would think of as organic, but it isn't labelled as such because they choose not to participate in government certification programs. In short, "organic" can mean variations on the same thing, or very different things, and, as far as food is concerned, is a label of convenience. If you have a very specific interest in the details, you need to dig a little deeper to uncover the specific standards that underlie the label. If you asked me if the produce I grow at the Ranch is organic, I would say yes, because I don't use dangerous pesticides. I can say that without being certified because I don't sell what I grow; I just eat it and share it with my friends and neighbors. I find that it promotes fair relationships and a good quality of life. Something has damaged a number of leaves on one area of the the Santa Rosa plum tree; they're ragged around the edges and look a little tattered. Wind damage? It's been windy the last few days, so it could be that, except there is nothing for the leaves to have been tattered against, and most of the damage is to the edges of the leaves. Wind damage would manifest on the entire leaf. Not wind damage. Maybe caterpillars. The edges definitely look like little bites have been taken out of them, just the kind of nibbles that little caterpillars take. The problem is the damage is spread over a number of leaves on different twigs; caterpillars are mobile, but not quite that mobile, so it would have to be a lot of caterpillars. I would probably have noticed a lot of caterpillars, or at least their droppings, and this is fresh damage so some of them would still be around. Not caterpillars. Leafcutter bees? Most leafcutter bees cut large ovals out of the edges of leaves, resulting in a very distinct shape. Nope, not leafcutter bees; dismiss that without another thought. How about grasshoppers? Grasshoppers chew in a very ragged pattern, and that fits. Grasshoppers jump from one leaf to the next, so that solves the problem of damage on multiple leaves. Most grasshoppers are large and their bites are correspondingly large; these are pretty small. Except, it's late Spring and that's grasshopper nymph season, and grasshopper nymphs take little bites, just like these. Problem solved: it's grasshopper damage. A magnificent example of reasoning and analysis. Also entirely wrong. Five seconds after I reached my carefully thought out conclusion, a little tiny bee landed on a plum leaf right in front of me, cut out a tiny little ragged piece of leaf, and flew on her merry way. I forgot about this one: I've seen her before, but we've never been formally introduced. The damage to the plum is minor and we don't want to harm pollinators, so I'll let her do her thing unmolested. There's no effective control available anyway, so that was an easy call to make. My Chilean mesquite tree in the back fell over in a storm about a year ago. I tried raising it but it fell again in the next storm so I left it on its side to see what would happen. Then I pruned hoping that it would grow up and again become a shade tree. I think I might have made too many pruning cuts as there are not many branches now. However, the tree does have new green leaves and I am hoping that it will flourish. Do you think it has a chance? As they say: where there's life, there's hope. Green leaves mean it has a chance, but only if someone stops pruning it. For those who have the space, a fallen but still growing mesquite tree can be a very decorative addition to the landscape; as it is nearly impossible to effectively raise a fallen mesquite, it's also about the only practical way to keep the tree once it's failed. The first consideration is safety; if it's possible that the tree may fall further and injure someone, then it needs to be taken out. That aside, it is important to let the fallen tree grow. Consider: the tree has gone through a major trauma and really needs all its resources to get through it and recover its health. If it is pruned, that limits its ability to feed itself and gather the resources for new growth. Your best bet now is to leave your tree alone and let it grow into the unique and interesting shape that comes from a fallen tree. No tree really responds well to our attempts to radically shape it into something that fits our wishes, and that applies doubly to a fallen tree. In a few years, you may be able to do some very selective pruning to encourage certain patterns of growth, but if you really need a shade tree of a certain determined shape, you're better off to take this one out and start over. And now you know why I don't recommend Chilean Mesquites! The first known tomato of the season! Right there in the middle; the little green thing. I spotted this perhaps one-quarter inch long green tomato a couple of days ago and it's now up to about three-quarters of an inch and joined by a multitude of companions. This particular variety is an experiment, a variety called "Sausage" that I hadn't tried before. I started them indoors from seed purchased from the Victory Seed Company (victoryseeds.com), which specializes in open-pollinated and heirloom garden seeds, then moved them out to the garden when the weather was sufficiently warm. Sausage is a paste-type tomato which has several attributes that suggested it was worth a test. First, it's a short-season tomato, listed at 70 days, which is always good for the fast-moving seasons in the Desert Garden. It's also an indeterminate variety, meaning it will continue to grow, flower and set fruit as long as the weather allows; generally until temperatures are consistently above 90 F and the pollen is no longer viable. Considering the vagaries of weather in the Desert Garden, we should appreciate any vegetable that is willing to try and fail, and yet try again. Indeterminate tomatoes are also called "vining tomatoes" because of their sprawling habit; this is a bonus because it means much of the fruit will be shaded under the vine, and somewhat protected from the Desert Sun. The slightly elevated humidity under the canopy of the plant will also help keep the tomatoes' skin from cracking as they ripen. And, last, the catalogue description used the words "interesting," "unusual," and "flavorful" so I had to at least try it. The time immediately following fruit-set is critical in developing good tomatoes, as it is for any fruit. After pollination and fruit-set, fruit undergo a fairly short period of rapid cell division, followed by a much longer period of cell expansion. The cell division period in tomatoes lasts only about a week, while the cell expansion period is 6 weeks or so. There's all sorts of fascinating chemical and hormonal things going on during this period, but what's really important is to realize that the ultimate size of the fruit is determined in that first week; only the cells that develop then will have the chance to expand later. On a practical level, what that means is that we need to make certain that the tomato has steady, even moisture during that phase of cell division. If the tomato is drought-stressed during the cell-divison stage, no amount of later watering will make up for it. In the Desert Garden, the easiest way to do this is to lay a good layer of organic mulch on the surface of the soil around the plants. Mulch holds water in the soil and helps eliminate the fluctuation of wet/dry that occurs in unmulched soil. Even moisture is important during the expansion phase, too, but right now it's critical. It's the difference between tomatoes that are apparently going to be interesting, unusual, and flavorful, and tomatoes that are simply not worth the bother. Driving home yesterday morning I noticed once again the number of crews out and about pruning trees. I paused for a few moments at one site and watched as within minutes a mature, well-shaped, shade-giving mesquite was reduced to one scrawny, crooked stick with a little tuft of branches way up on top. The crew started the job standing in nearly full shade and by the end they were standing in full sun – without even moving. We seem obsessed with pruning trees around here. Common practice, especially among those who are paid to prune trees, is to treat tree pruning like getting your teeth cleaned at the dentist: do it twice a year whether you need it or not. But the truth is, tree pruning is more like surgery: you should only do it when you really need it. And, no, cosmetic surgery doesn’t count. Any time we prune a tree we damage it. Trees, like humans, are protected by a skin – bark, in the case of trees – that helps to exclude diseases and parasites. Every time we prune a tree, we open a wound in that skin, making the tree susceptible to insects and pathogens. Trees, unlike humans, make their own food. While we can provide a tree with water and fertilizer, those don’t feed the tree. Trees make their own food in their leaves, through the process of photosynthesis. Any time we prune a tree, we prune off leaves, or leaf-producing twigs, and reduce the amount of food that a tree can make for itself. Too much pruning, and the tree goes into stress because of a lack of food. Trees that are pruned too much become weak, grow poorly, and never develop the strong trunk and branch structure that makes for a sturdy, safe, and strong tree. Trees provide specific and measurable benefits in the landscape, including shade, heat reduction, dust reduction, and more. They also add a calculable monetary value to a property. Whack a tree into a funny shape and you get none of that. Trees that are over-pruned or pruned incorrectly can and do become a legal liablity. If a tree is pruned in such a way that it consequently fails and damages life or property, the tree's owner may be legally liable for damages. And, lastly, you have to pay someone to prune your tree; isn't it worth your while to make certain you're spending your money on something you need? If you've got excess cash, send it to the orphans. So, what are good “whys” for pruning trees? There are really just two: to remove dead, diseased, or injured wood, and to keep your tree from being a nuisance. "Nuisance" does not mean, "Look, that darn tree is growing again." That's not a nuisance; that's what trees are supposed to do. "It's getting too big," doesn't cut it either; you need to finish the sentence: getting too big for what? Obscuring traffic, interfering with your roof tiles, making the sidewalk impassable; those are good reasons to prune a tree. If your tree is getting into the power lines, that's an excellent reason to prune a tree; call the power company and they will do it for you, safely and for free. Before you have your tree pruned, ask yourself: why? If you don't have a good answer, then don't do it. You will have a cooler, shadier, safer, and less expensive landscape. Melampodium leucanthum, called the Blackfoot Daisy, is the perfect perennial "daisy" flower for the low-water Desert Garden. This Southwest native is a fast grower, providing a steady mass of bright white flowers nearly year-round, and forming a low mound 6 to 12 inches high and eventually two feet wide. M. leucanthum thrives in high heat and low water, and takes full sun or lightly filtered shade. It does require well-drained soil and won't tolerate standing water. Blackfoot Daisy can be a real Ugly Duckling in the nursery, but don't let its scraggly appearance fool you: once it gets going in your landscape it will form a small floral blanket in tough conditions. If it finds a place it likes, it will reseed at a moderate rate. Use Blackfoot Daisy as a fine-textured ground cover flower, as a soft edging for agave and columnar cactus, and at the edges of native wildflower plantings, where it can keep the floral display going all Summer long. It has a very light, very sweet scent, which you may not notice unless you plant a lot of them or get down on all fours and really stick your face in it.